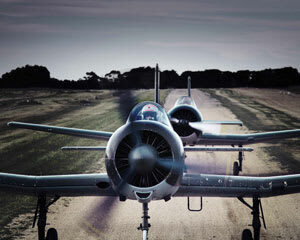 Get ready to get upside down and then some over Melbourne in this awesome 35 minute Aerobatic Warbird Flight Experience. You will be treated to a barrage of awesome aerobatic manoeuvres. If you feel the need for speed and G-Force and want to view Melbourne upside down from 4,000 ft the this 35 Minute Aerobatic Flight from Melbourne was made for you! The Nanchang CJ-6A Warbird will climb to 4,000 ft before starting a series of maneuvers which will steadily increase in intensity and G-Force. You will then experience what it felt like to be a WWII Fighter Pilot in a high powered military aircraft - experience the intensity of an aerial dog-fight twisting, turning, climbing and diving to elude the enemy and gain the upper hand. Throughout your aerobatic flight you will maintain constant communication with your professional pilot so they can tailor the flight to just the right Adrenalin intensity for your needs. As well as an incredible series of aerial stunts you will also enjoy spectacular views (some upside down) of Melbourne and Port Phillip Bay. Book Now for a flight you will never forget!